Fall is here! Well, at least it was supposed to be fall after Labor Day (even though the official first day of fall is September 23rd), but it’s been almost 90 degrees around here. That meant that my daughters’ first-day-of-school outfits were left in the closet only to have them dress in their summer shorts and tank tops for the first day of school. Although the weather may be hanging on to summer, I’ve completely given into my fall food cravings. This time it’s pumpkin; streusel pumpkin muffins to be exact. 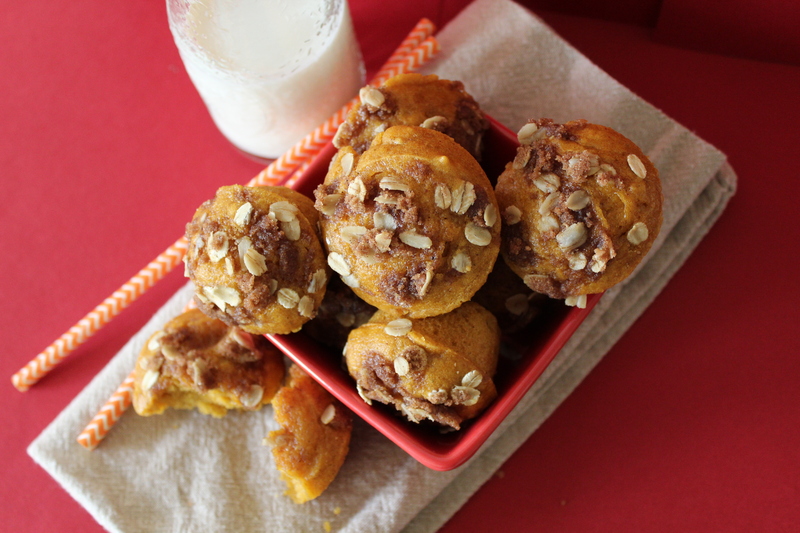 These muffins are loved by my daughters and every child whose ever eaten them. I think it may be the moist little cakes or the crunchy, toffy-flavored streusel that hooks little ones to this treat. My older daughter says she doesn’t know what it is about these pumpkin muffins. All she does know is that she loves them! These are super easy to make. My six-year old made these almost entirely herself. I handled the oven (taking the muffins in and out), and I helped her scoop the batter into the mini-muffin tin. But other than that, she did everything herself. Well, everything except wash the dishes! 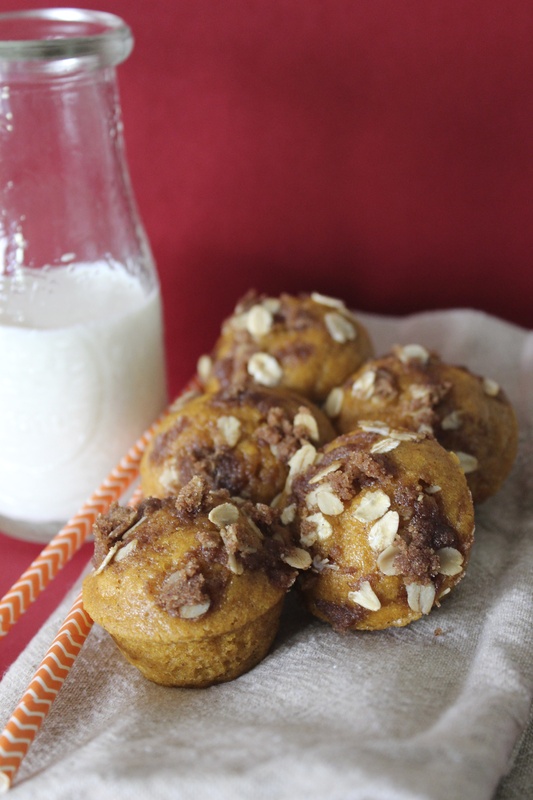 I’m sure we’ll be making streusel pumpkin muffins many, many more times this season. They’ll definitely make an appearance at Thanksgiving and maybe even Halloween! These moist, fluffy, muffins are full of pumpkin flavor, and the buttery, oat streusel topping gives them the perfect crunch. For the oat streusel topping, using your fingers, mix all the ingredients in a small bowl until combined. Set the topping aside. For the pumpkin muffins, heat the oven to 350 degrees F.
Grease a mini-muffin tin with butter. In a small bowl, whisk the flour, baking powder, baking soda, salt, and spices. In a large bowl, whisk the pumpkin, oil, eggs, and granulated sugar. Fill the muffin tins about ⅔ full. Allow the muffins to cool in the pans for a few minutes. Turn the muffins onto a cooling rack. Allow them to cool completely. These look so delicious Aida! The streusel topping puts them over the top! Pinning for later, I really can’t wait to try these!! 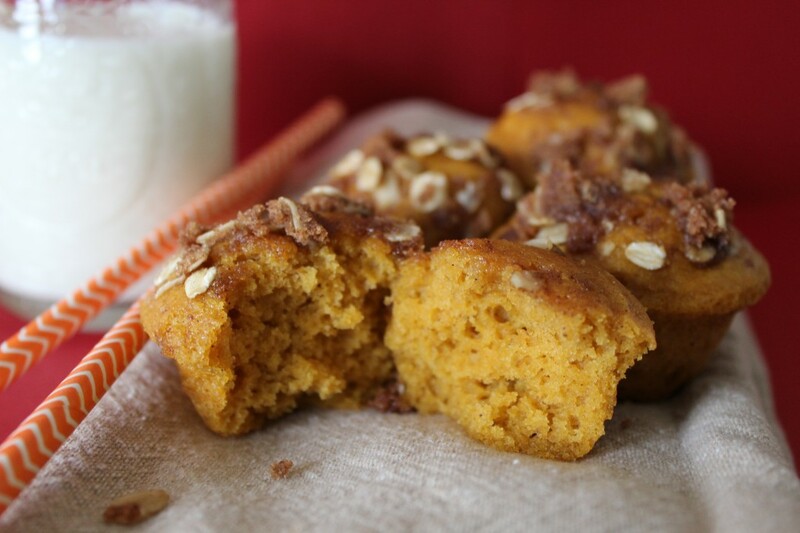 Your Pumpkin Muffins look like they are just packed with flavor! Thanks so much for sharing with Full Plate Thursday and hope you have a great week. I’m still eating salad and holding out on summer. 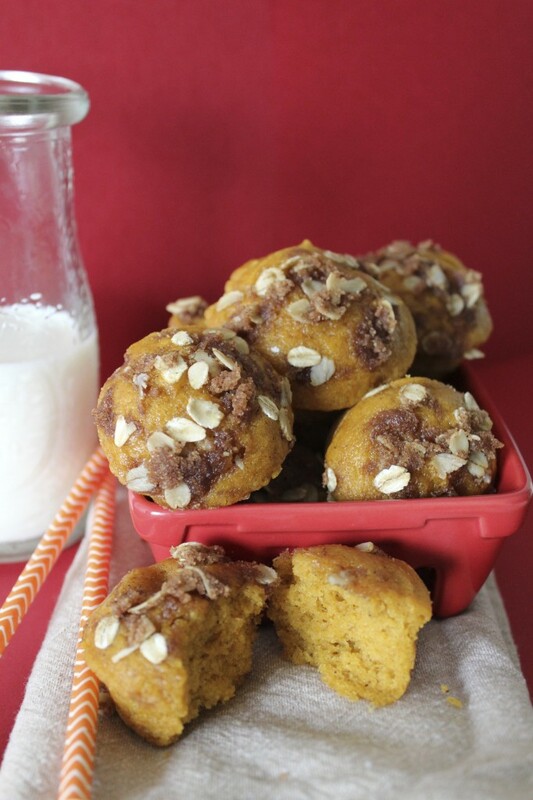 But I’m pinning this recipe love the idea of streusel on a pumpkin muffin.